Why Buy a Wooden Balance Bike? 1.) The Environmental impact - wood can easily be recycled and biodegrades much more quickly than plastic or metal. 2.) Lightweight - wooden balance bikes are often very lightweight with many weighing less than their metal counterparts. This means they can be easier for smaller children to control. 3.) Stylish - they look good and stylish. 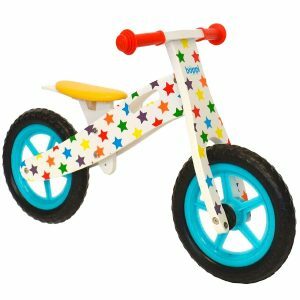 Many manufacturers of wooden balance bikes offer a wide range of designs for girls and boys. There are some great painted designs to choose from. Check out below a range of balance bikes with options suitable for the youngest of toddlers (from 18 months) and bikes aimed at 2, 3 4 and 5 year olds. The Kidzmotion wooden Balance Bike has a birch / plywood frame and comes in many different designs. Find the Jiggy and sweet pea designs featured. It has an adjustable seat height with 3 different settings (34cm, 36cm and 38cm). ✔️ Important advice - kids need to be able to put their feet on flat the floor when they sit on the balance bike seat. This is so they can push the bike along. Therefore, to accommodate your child the seat height on a balance bike should measure approximately 1 inch (2.5cm) less than a child's inseam (inside leg measurement) allowing them to get on and off the bike easily. Check how to measure a child's inseam here. This bike features proper rubber inflated tyres. This means the balance bike offers a comfortable, smooth ride and traction on the surfaces. It is recommended for 2 to 5 years, but the most important thing is the child has the correct inseam for the bike's seat height as mentioned above. The seat is soft and padded giving extra comfort to the rider. The bike weighs 4.54kg so is very lightweight meaning that it's easier for young children to be able to manoeuvre and control. ​It also features soft handlegrips with safety ends. Safety ends are important as they can prevent children's hands from scraping and banging into walls and the floor (if they fall over). The bike is easy to assemble and comes with a carry handle. ✔️ Type of Wood - Many balance bikes are made out of birch plywood. If they have a lacquer veneer, this will offer some additional protection from water but not enough to leave it outside in the rain. Some can be made out of marine grade wood, then you don't have to worry if it gets left outside too much, however bikes made from marine grade wood tend to be more expensive. This bike has a super low seat height making it a good choice for little legs of toddlers. The seat height ranges from 22 to 24cm (so check your child's inside leg measurement) to make sure it won't be too small before you buy. It features a birch / plywood frame, 20cm wheels with wooden infill, soft padded seat and soft padded handlebars with padded ends. It weighs 2kg so is light enough for little children to manage. Ideally a bike should be no more that 1/3 of a child's weight so they can easily control it. ✔️ Weight - Wooden balance bikes tend to be very lightweight. The more features a bike has the heavier they tend to be. So you will see heavier wooden bikes with features such as inflatable tyres and more seat height settings. Ideally a bike should weigh no more than 1/3 of a child's weight. A lighter bike will be easier for little ones to control. The Early rider classic 12 inch balance bike is the creme de la creme of wooden balance bikes. It's made out of weatherproof marine birch plywood, which is FSC approved. It will withstand the rain and wet so you don't have to worry about the wood deteriorating due to the weather conditions. It has pneumatic tyres to give some extra cushioning and it means it will be better going off road and on uneven terrain. It has a minimum height seat of just 31.5cm so it's a good choice for young and small riders. (Measure their inseam to check it's the right height for your child). The maximum seat height is 39cm so it does have a good seat height range to accommodate a growing child. It weighs 4.25kg so it's not the lightest balance bike out there but it's still not too bad. Bikes with pneumatic tyres do tend to be heavier. If you are looking for a wooden balance bike that is very lightweight, the Nicko Children's balance bike is a great option, weighing just 2.5kg. And it's at an excellent price point. That's light enough to easily carry when kids have had enough of this bike at the park. It has a built in carry handle to allow you to do just that. And lightweight bikes are easier for young kids to control. The tyres are puncture resistant 28cm Eva foam tyres (not air filled). Eva foam tyres are great for riding along pavements, paths and smooth surfaces. They also have the advantage of not having to pump them up. The bike has two seat heights (35cm and 38cm). Check the seat height against an child's inside leg measurement. It should be 1 inch less. The bike features and eco-friendly birch plywood frame. It comes in many different colourful designs. ✔️ Take Care of Your Bike - Avoid leaving your balance bike outdoors in the rain, unless it is made of marine grade wood which is the same wood used by yahts and boats. If you are looking for an options with a super wow, cool faction this is the one to get. It features a birch plywood frame in unique motorbike design. It's easy to assemble and includes numbers 2, 3, 4 & 5 stickers to personalise for your childs age. It has 3 adjustable height settings (38cm, 40cm and 42cm). Again measure your child's inside leg measurement and minus one inch (2.5cm) to make sure the bike will be a good fit for your child. This bike features the hightest maximum seat height on this page, so it's one worth considering for taller children. ​The bike has 30cm wheels with wooden infill and inflated tyres - offering more traction for surfaces such as grass as well as a comfortable and smooth ride. Other notable features include soft plastic handgrips with safety ends and a soft padded seat. The Boppi balance bike is one of the bestselling wooden balance bikes over on amazon. It is another very lightweight option at only 2.4kg. It has 2 different height settings for the saddle. They are 35 and 39cm. There are some very funky designs for this one. Perfect for boths boys and girls. The tyres are puncture proof and made of EVA foam. It's great for both indoor and outdoor use. The handlebar height is 53cm.